I'm a US-based portrait and advertising photographer, but I'm a big gear head at my core. For several years now, I have been travelling the country photographing real and replica iconic movie and TV cars as part of a personal series I call The Unicorn Project. The whole series has been a mind-blowing experience for me, having photographed, ridden in, and driven some of my favorite movie cars of all time. 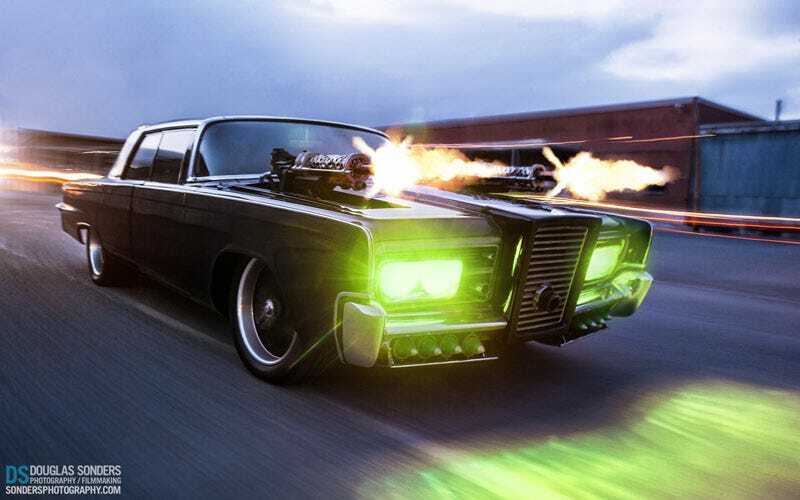 The "Black Beauty" above is one of the actual screen-used hero cars from the 2011 film, the Green Hornet. Movie cars are a funny thing because in your head you almost expect them to perform like they did in the movie. Except in this case, for example, the car had a 5 gallon gas tank and gets around 7 MPG currently so we couldn't go very far. If you'd like to see how I put together the shot above, check out the video below and you can also read more here. Have a real or replica TV or Movie car? Know someone with cool backstory that does? I'm also working on a series about people that make and wear their own Iron Man costumes! Make sure to hit me up here. Chances are I will come photograph you for free to be a part of my personal projects! Portrait of Robert, the car's owner. Special thanks to him for being so helpful with the project and just being an overall great guy.